A selection of steam accessories from the Samuel Downey Jr collection. 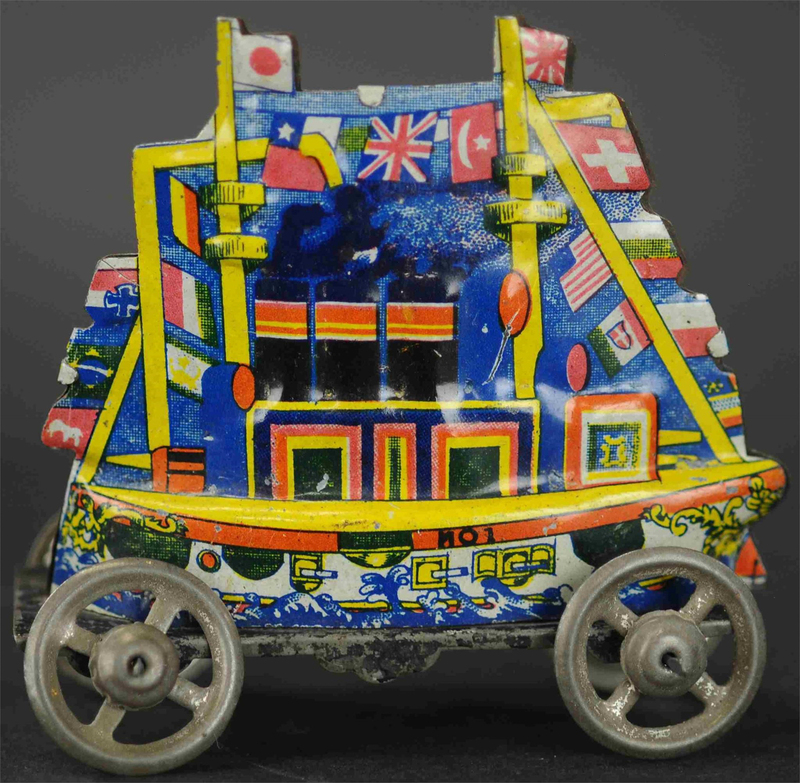 Quite colorful, they ranged from amusement rides and lighthouses to gondolas and castles. VINELAND, N.J. – Four early toy collections converged in Bertoia Auctions’ March 9-10 Signature Sale. The auction, all 810 lots of it, was a colorful display of early paint, fine mechanisms and connoisseurship from both sellers and buyers. 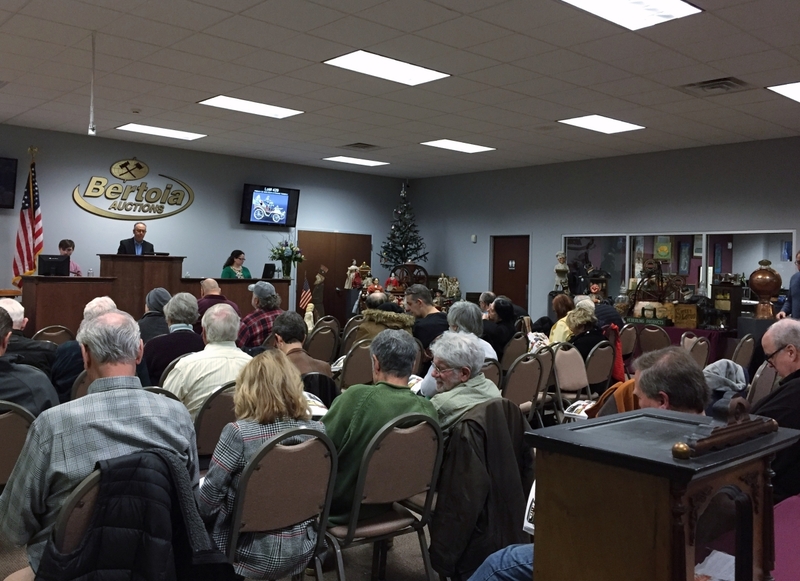 Selling all but six lots, the auction would produce a 99.3 percent sell-through rate and a total gross of $2.3 million. 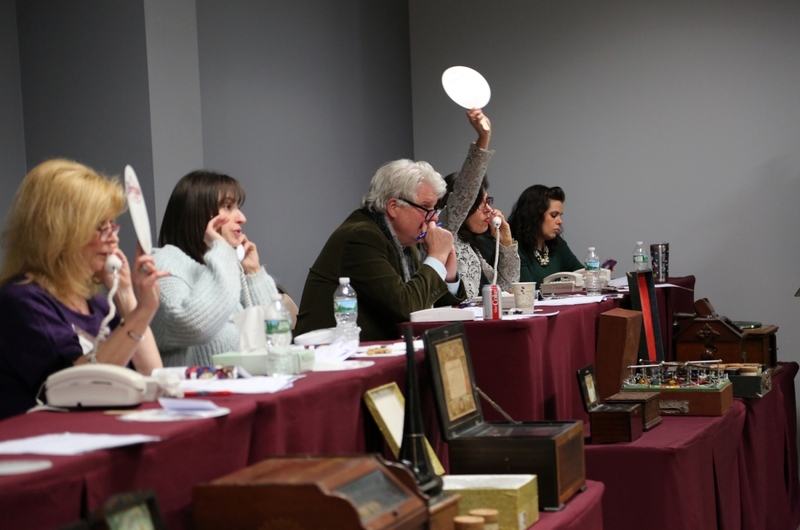 Bidders were active through all channels, with 35 percent bidding by live attendance and absentee, 42 percent on the phones and 23 percent over the internet. 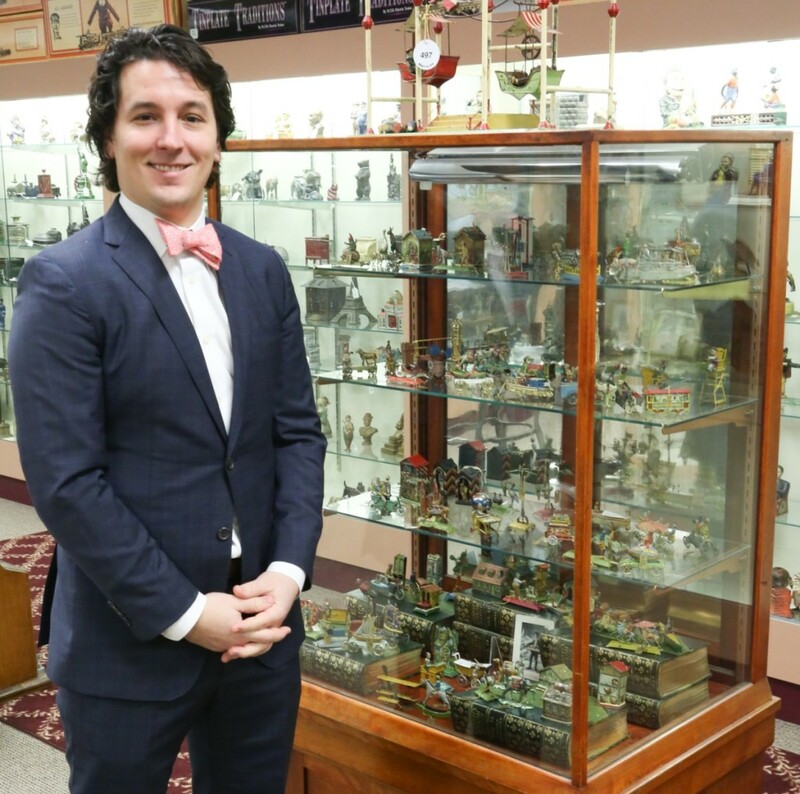 Auctioneer Michael Bertoia, who cataloged the weekend’s offerings with toy specialist and dealer Michael Caffarella, said that the sale was evenly split in interest among domestic and international collectors. The collections represented herein were each the product of decades of buying and focused stewardship. They included the collections of Frank Mohr, Douglas Jackman, Samuel Downey Jr and the auctioneer himself, Michael Bertoia. The second half of Frank Mohr’s collection offered in this sale, following the first half in Bertoia’s September 2018 sale, was a further exploration of all things mechanical. Originally from Chicago, Michael Bertoia described Mohr as a devoted collector who was well-respected among his peers and active in the Antique Toy Collectors of America (ATCA). “He was a very nice and lovable man, loved by those who knew him,” Bertoia said. 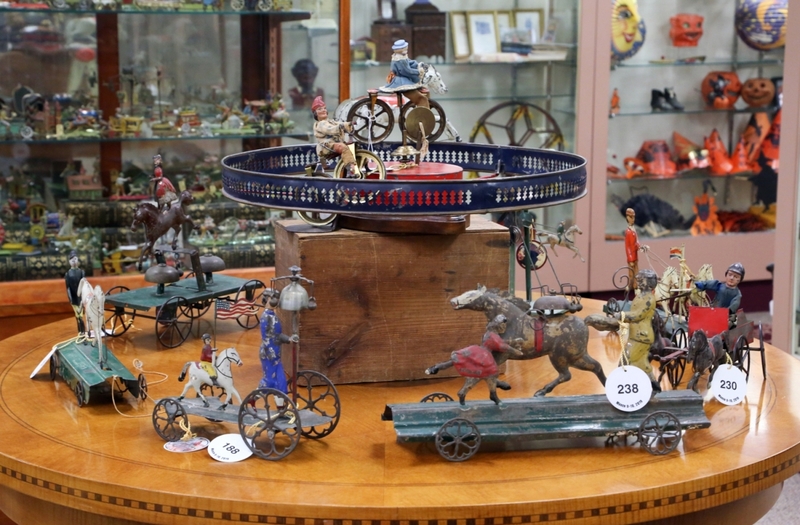 “He had several different collections through the years but always seemed to maintain a particular interest in mechanical movement.” That interest was itemized within an extensive collection of Fernand Martin toys, early American clockwork and tin toys and automata. 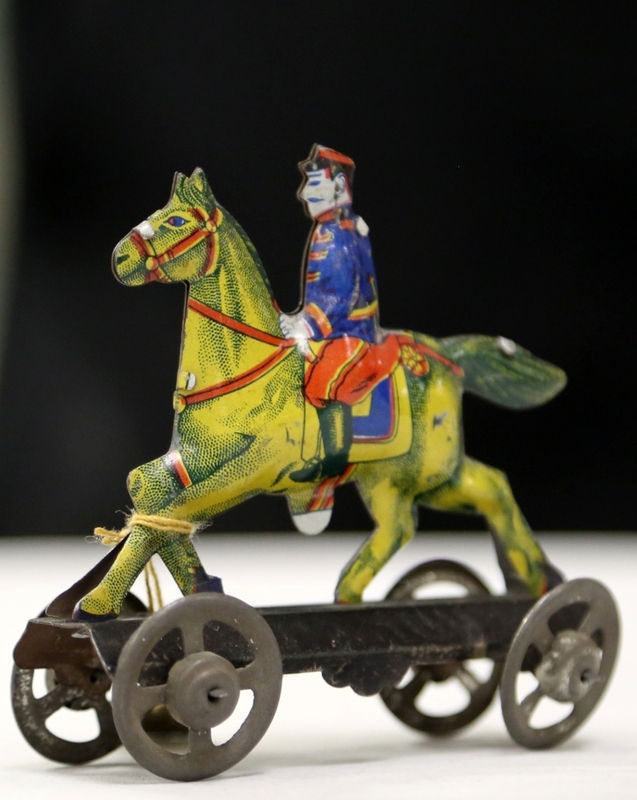 Mohr’s collection included an impressive array of works by French toymaker Fernand Martin. 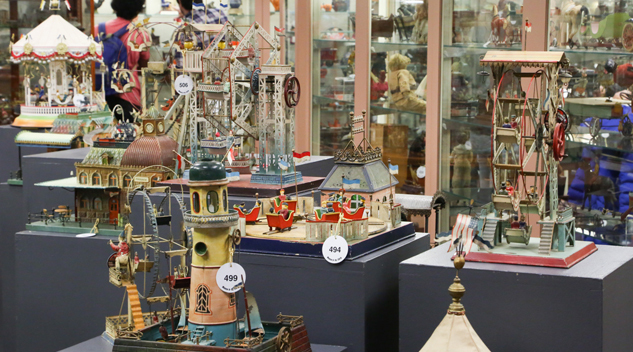 Mohr’s collection of 134 Martin toys was one of the best, and it was notable in that it was close to being complete, having been amassed since the 1980s. “They are very early, very rare and whimsical,” Bertoia said. “And that’s a lot of the appeal. They have themes that anyone can relate to.” Martin’s wind-up toys emulated everyday scenes of Paris. Some of them incorporated satire when showing off politicians; soldiers; or plump, wealthy businessmen. Others included performers, animals, bull fighters, children, farmers, laborers, explorers and everyday folks. “Prior to three years ago,” Bertoia said, “it was a matter of a dozen Martins on the market in a given time, in a given year. Compare that to today as we’re selling over 130 this year from Frank’s collection. We’ve had three major Martin collections come to market in the past three years, but they are genuinely rare items.” The other two collections included the Tony Daval collection, offered in March, 2017, and the Allan Frumkin collection, offered across November, 2017, and April, 2018. The top Fernand Martin lot was this boxed example of L’Intrepide Jockey, which sold for $12,000. It was in pristine condition. The model offers a bit of humor on the 1911 theft of the “Mona Lisa” from the Louvre. Frank Mohr collection. The result has been a feeding frenzy. 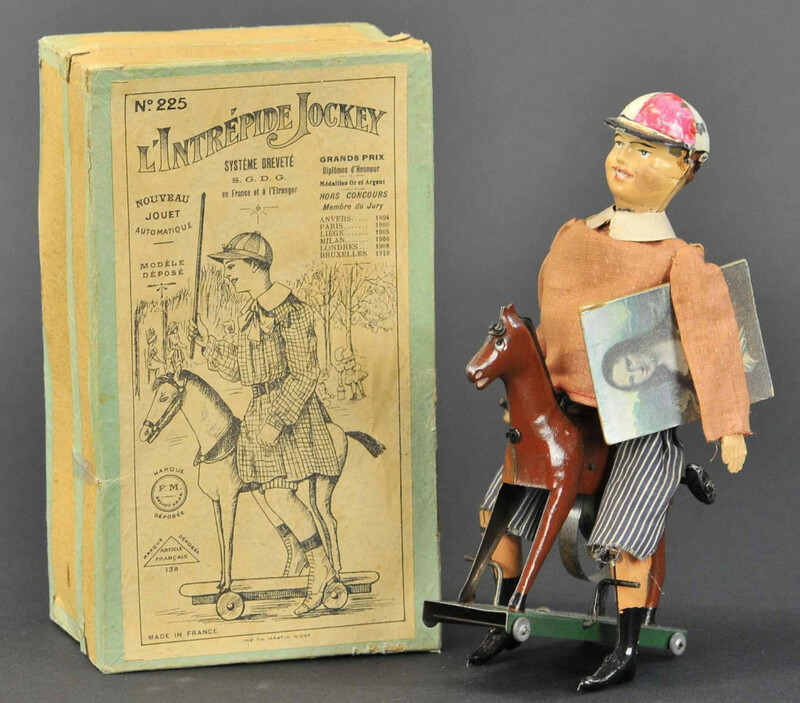 At the top of the Martin toys was L’Intrepide Jockey, a 7-inch-high figure of a jockey riding a wheeled horse with a clockwork mechanism and holding the “Mona Lisa” under his arm. 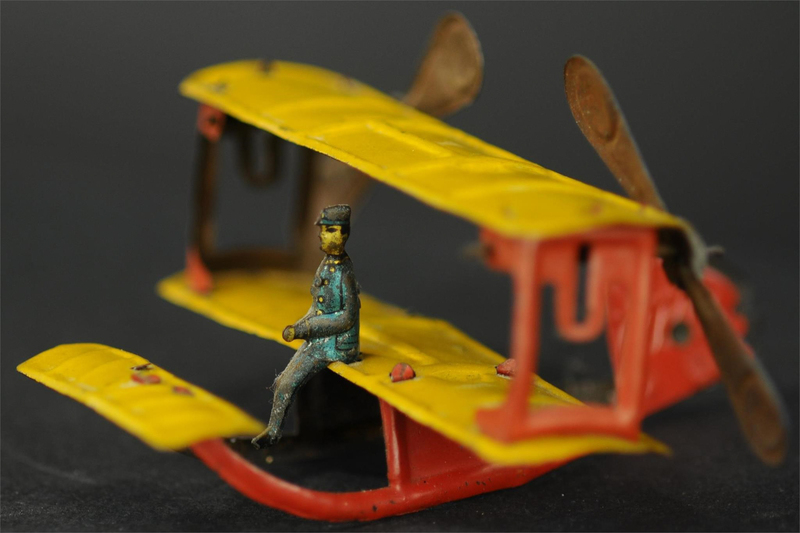 The toy came with its original box and bested its $7,000 high estimate to land at $12,000. 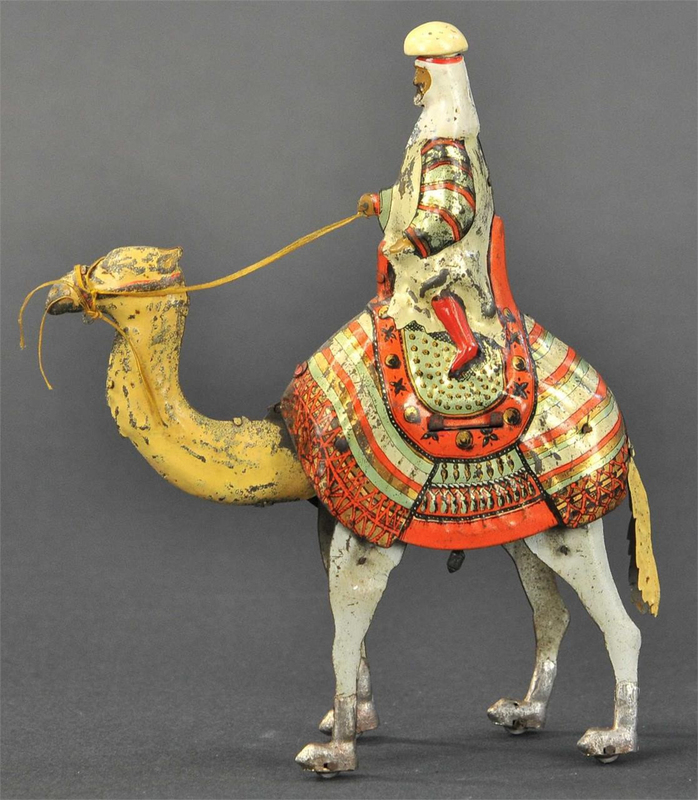 Behind at $11,400 was the 1892 Le Cherif, featuring a colorful nobleman riding a camel. 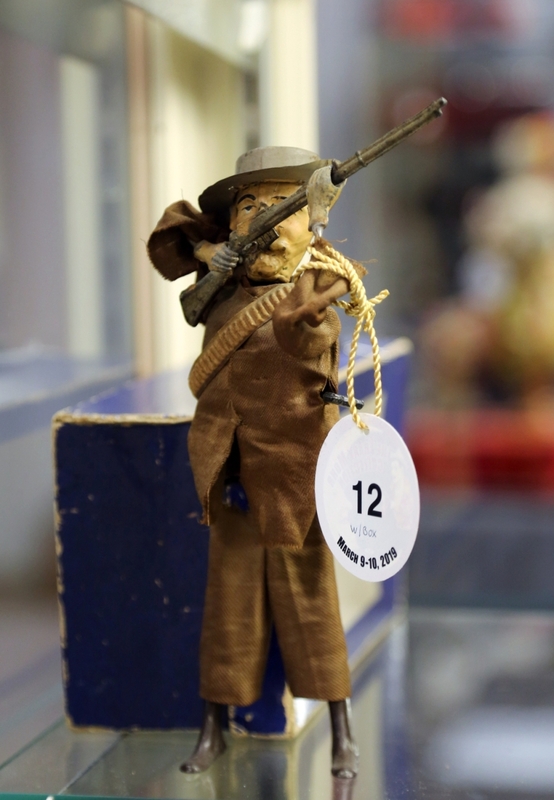 Bidders appreciated Valiant Boer, a soldier with his bullet band slung over his chest as he takes aim with his raised rifle. That brought $10,800, over high estimate. 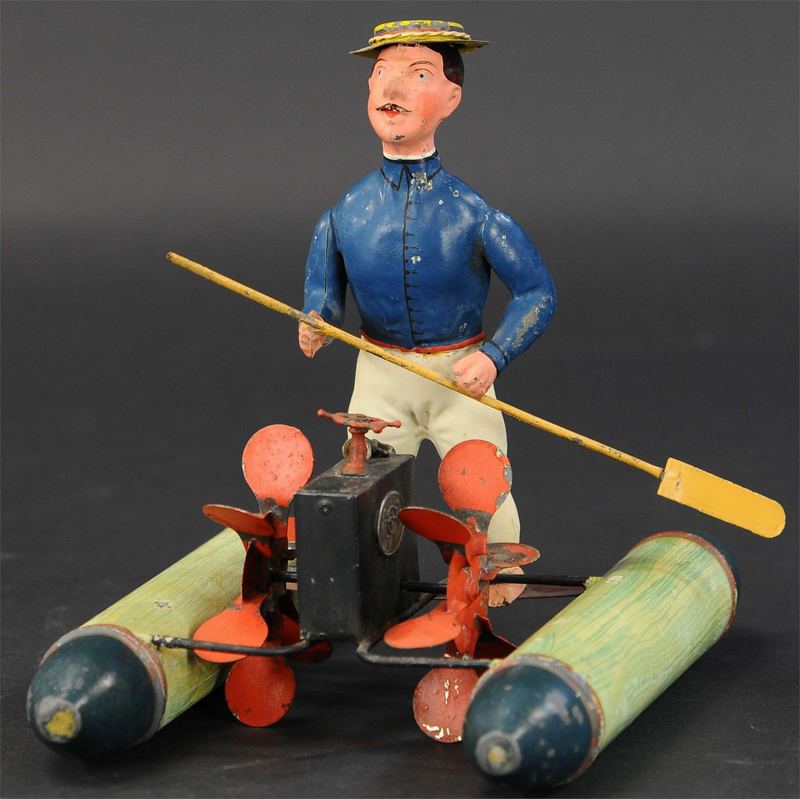 A boxed example of Les Pompiers, featuring two firemen working a water pump and one of the earliest Martin toys, circa 1887, would bring $9,600. 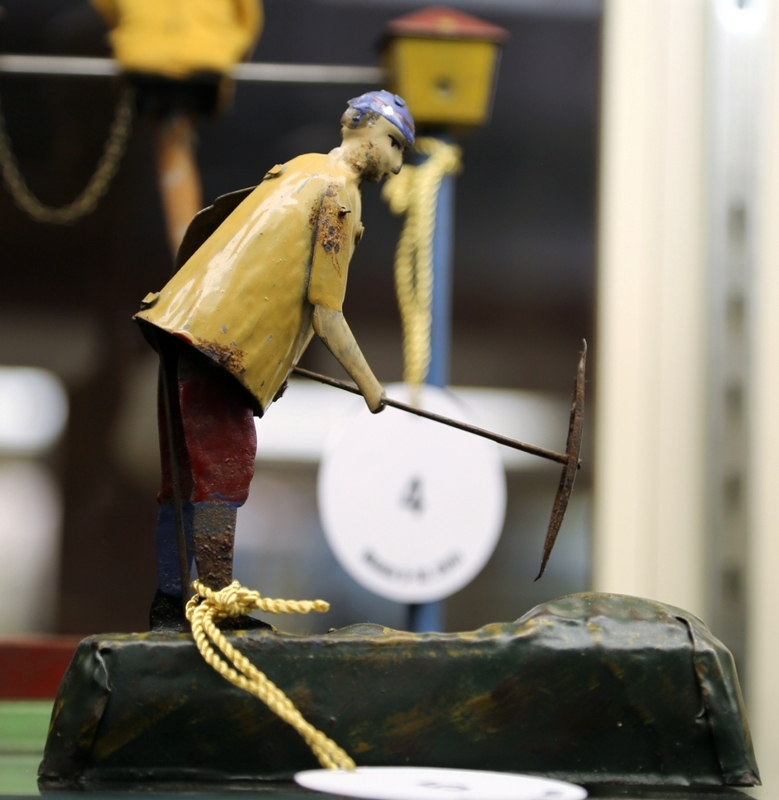 Le Piocheur, a circa 1894 laborer that chips away at the mound before him with a pickaxe, took $9,000. 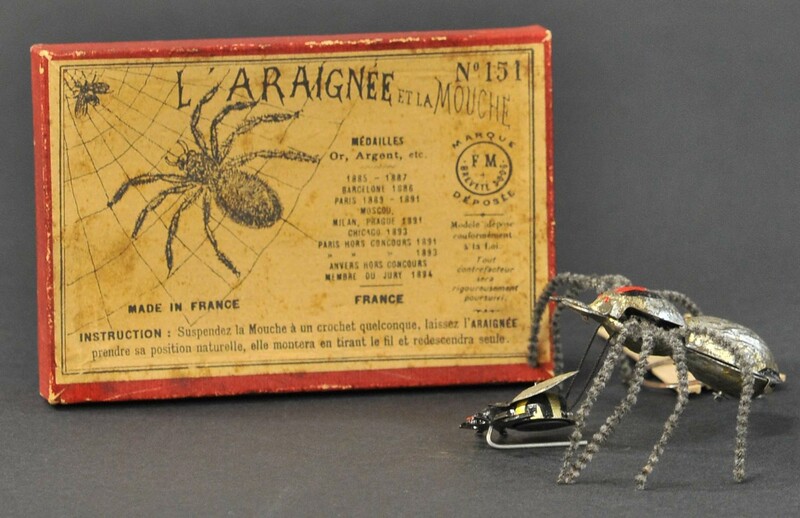 Shooting well above the $1,200 high estimate was L’Araignee Et La Mouche with box, a toy that features a spider chasing a fly. It sold for $8,400. The highest-selling female subject among Martin’s creations was La Jupe Culotte at $7,800, a circa 1911 clockwork toy that was named after the culotte pants she is wearing, a popular style at the time. In their catalog, the auction house noted that she was perhaps modeled after the Suffragettes of the first feminist movement in England. Other works from the Mohr collection garnered considerable attention. 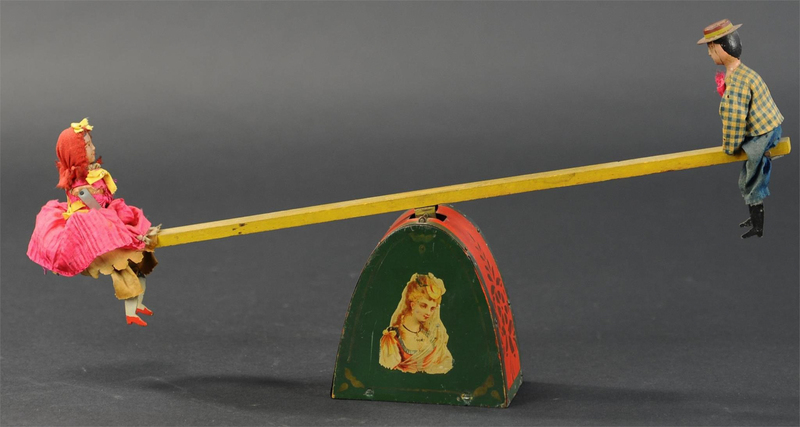 Notable here was a possible auction record for an Ives clockwork See-Saw toy in pristine condition. The example was pictured in a Louis Hertz book, and Bertoia said, “Arguably, I would predict that it’s the best condition example in existence.” The toy brought $10,800 over a $6,000 high estimate. Four lots before the Ives toy was a surprise sleeper in a mohair Teddy Roosevelt Rough Rider bear with original clothing. 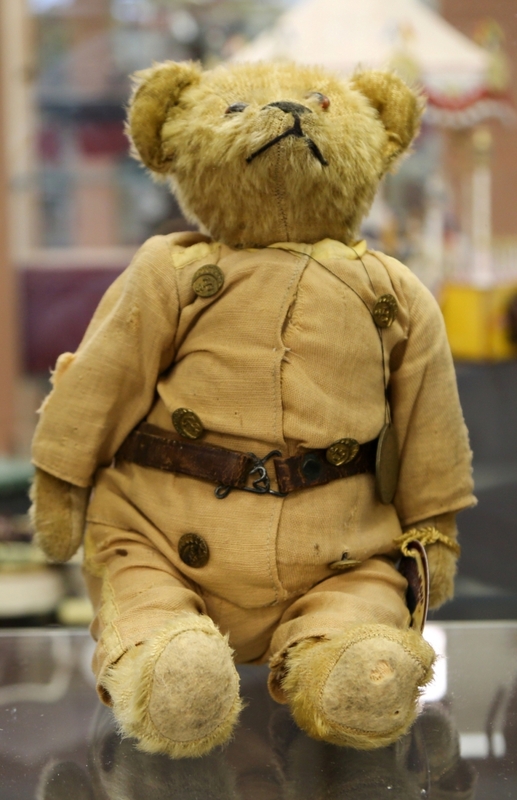 The circa 1907 bear brought $13,200 over a $1,000 high estimate. Bertoia said it was an example of two bidders battling it out. 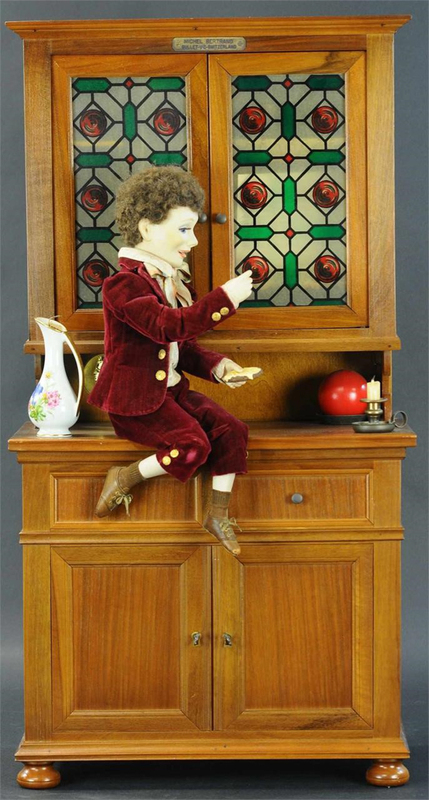 Among Mohr’s automatons, a musical example of Le Buffet Magique sold for $9,000. Bertoia uploaded a video of the entertaining mechanism to the firm’s Youtube channel, and it is worth a look. Round two of offerings from the still bank collection of dealer Doug Jackman saw a number of exceptional results. The old-time collection, which debuted in Bertoia’s September 22, 2018, sale, featured figural and architectural examples with fine paint and color. It took Jackman nearly four decades to amass his 1,295 cast iron still banks and a little over an hour for Bertoia to sell the 109 lots offered in this auction. 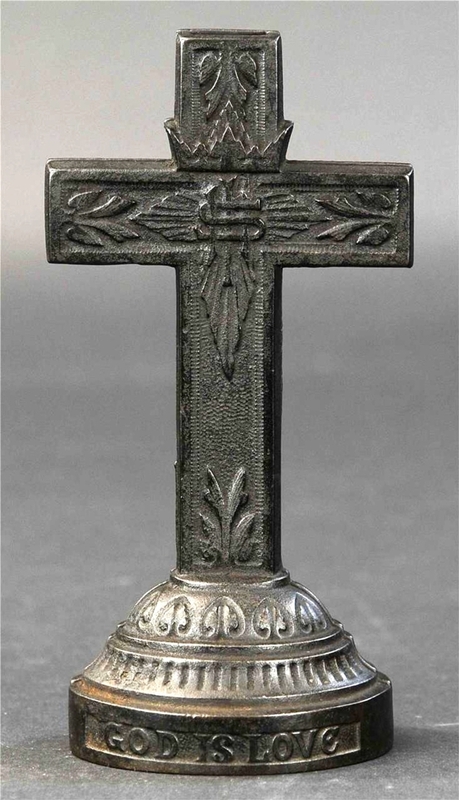 At only 20 lots into the collection would come its highest result, a Cross still bank, which brought $7,200. At 9¼ inches high, the unpainted bank is desirable for its rarity, with only a few examples known. 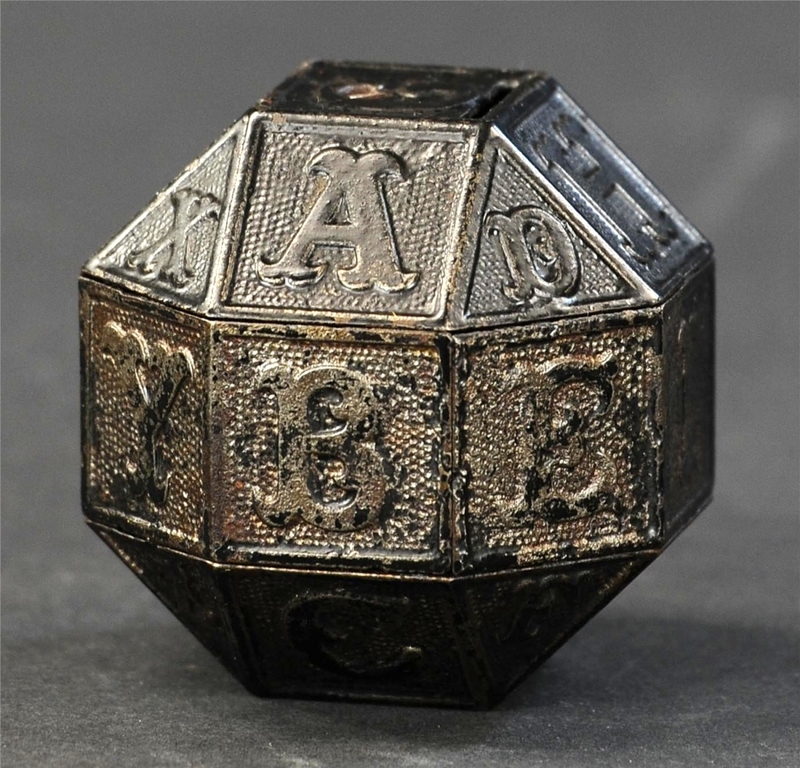 It features Christian symbolism, including the Eye of Providence, or all-seeing eye, and the words “GOD IS LOVE” and “FAITH HOPE CHARITY” written to its base. From the opening years of the Twentieth Century was AC Williams’ Two-Faced Indian still bank, which brought $5,400 over a $1,000 high estimate. “It was an exceptional price,” Bertoia said. 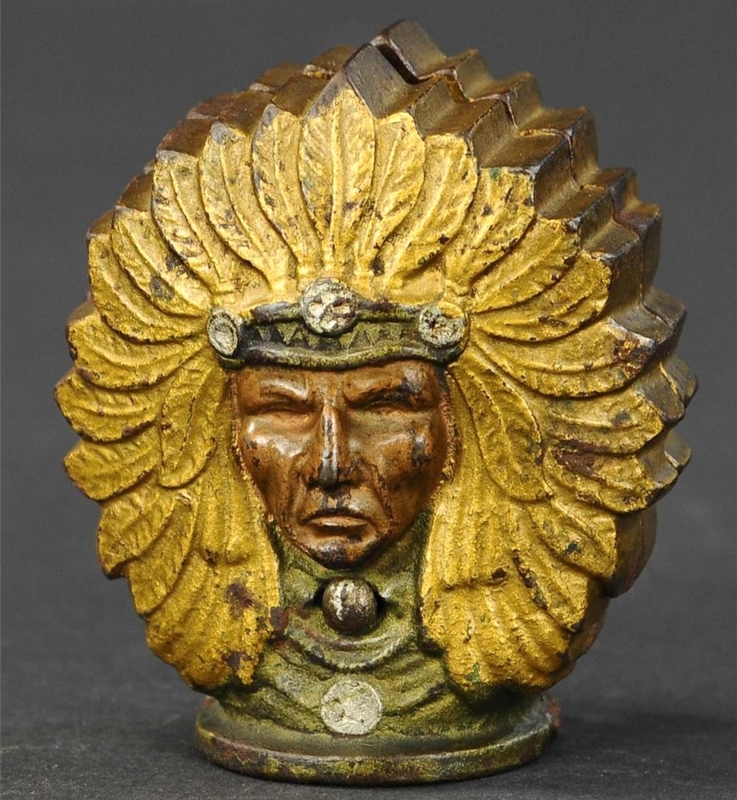 “Really surprised us in terms of how it did.” The example was in excellent condition with bright gold paint applied to the headdress. 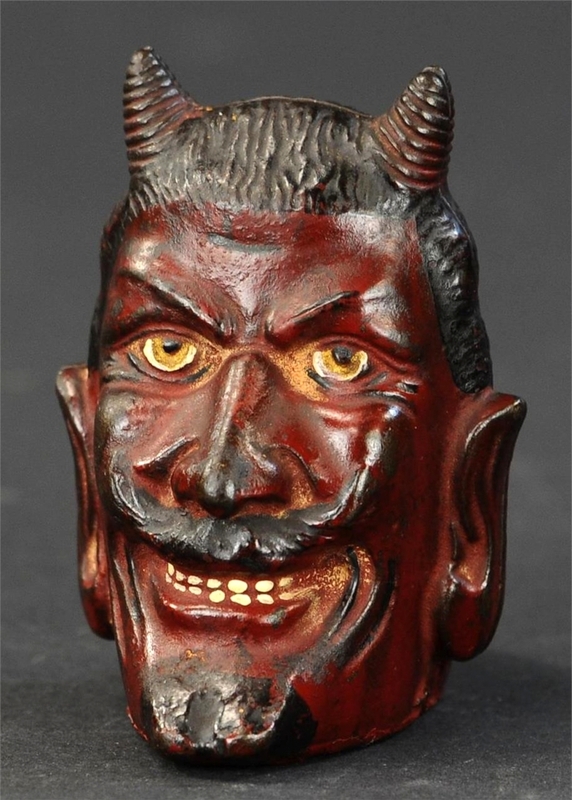 Doing its best to keep up with the collection’s top lot, a Two-Faced Devil still bank reached a fine result at $4,500 over a $600 high estimate. It was by AC Williams, circa 1904-12, and was graded excellent condition. The top lot from Doug Jackman’s still bank collection was this Cross bank. 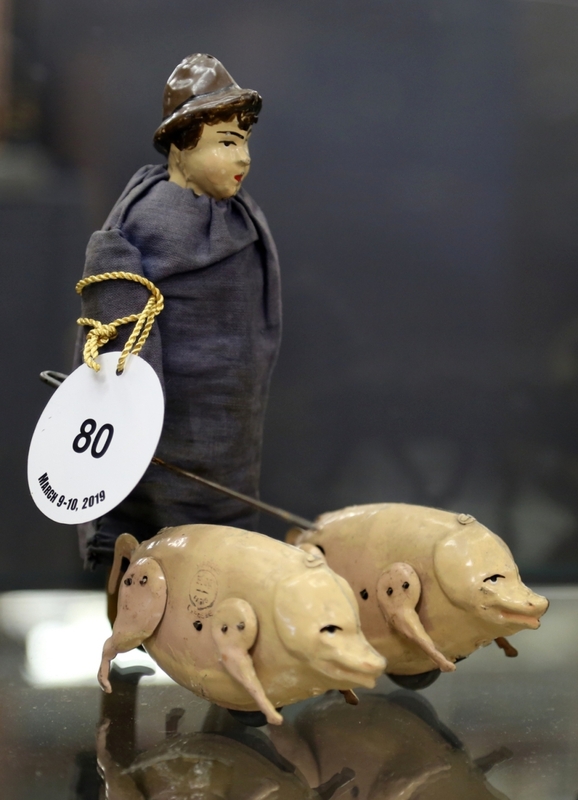 Very scarce and at 9¼ inches high, it would double high estimate and bring $7,200. Architectural examples were led by a large size Kyser & Rex painted State Bank with arched letters. 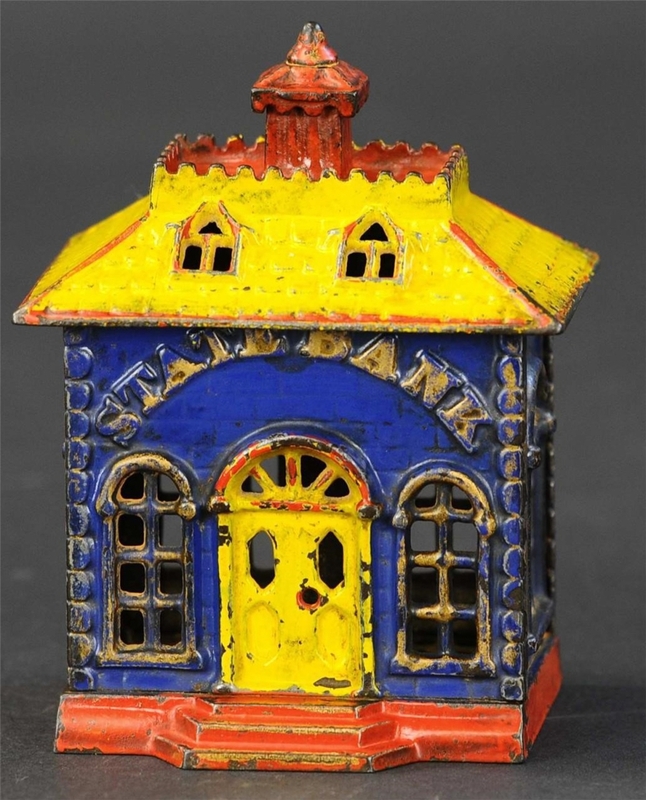 The building was brightly painted in blue, a yellow door and roof with red and gold embellishments throughout. It finished at $3,600. Behind at $1,680 was the same model bank but with more subdued colors, including a gray building, green roof and foundation, yellow door and red interior on the flat rooftop and chimney. It brought $1,680. 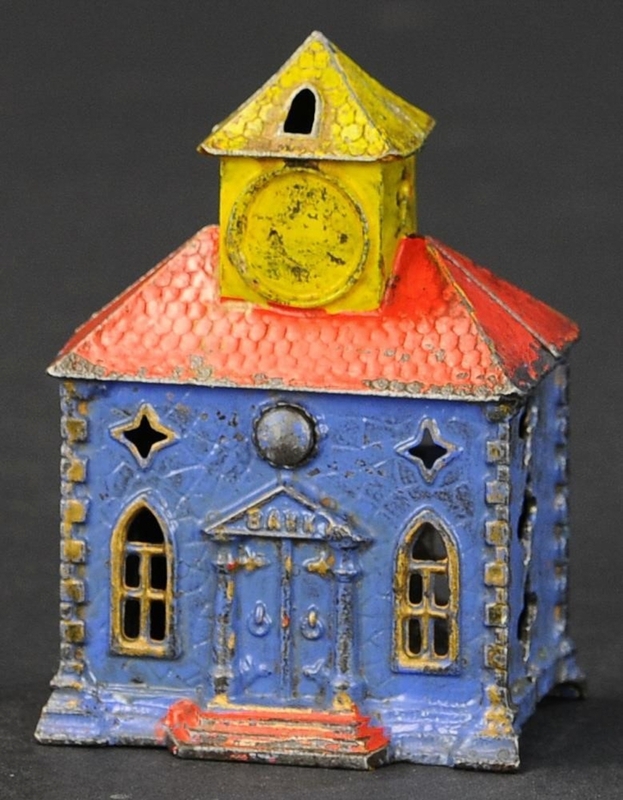 A small version of the same model bank also brought $1,680 with a red building, yellow roof and gold embellishments. 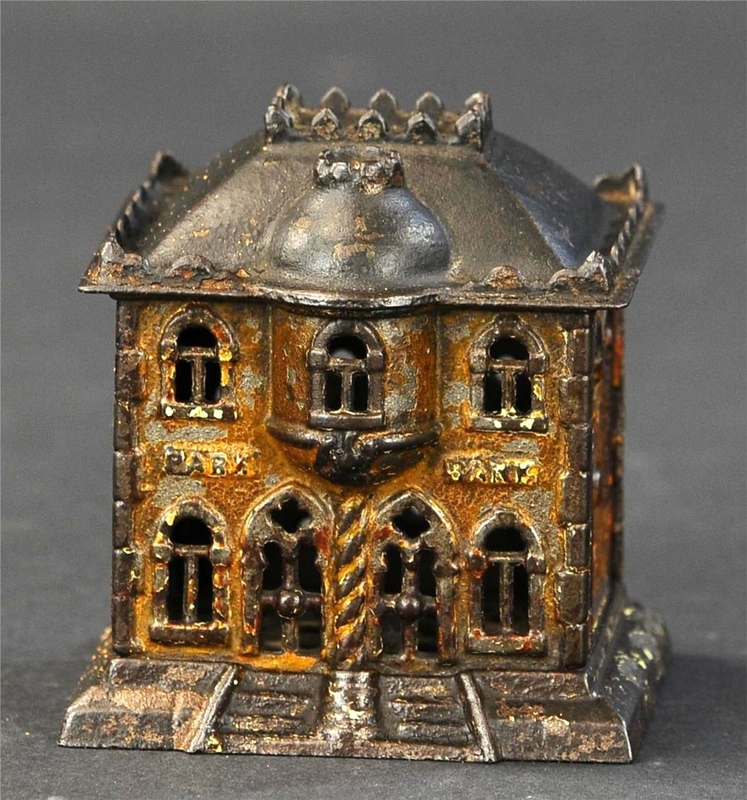 Not far behind at $1,560 was a circa 1882 Town Hall still bank by Kyser & Rex, 4¾ inches high and in excellent condition. A scarce Park Bank took $1,440, 4½ inches high and graded very good. In figures, a JM Harper Indian Family still bank featuring a Native American chief, wife and child went over high estimate to bring $2,280. 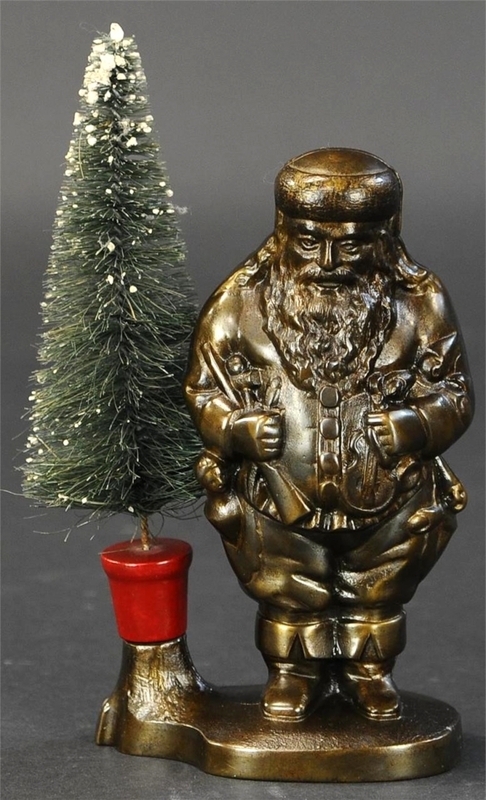 A circa 1890s electroplated Santa with removable tree by Ives took $1,920. Hubley’s Boy With Large Football still bank, with a gold ball and red painted figure, sold for $1,440. 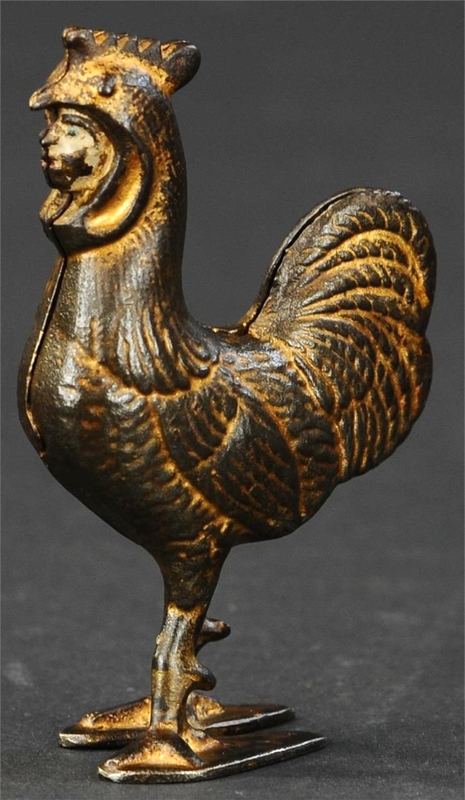 In animal forms, the Chantecler bank, which is really a boy dressed in rooster costume, sold between estimate for $1,920. In the form of an eagle is the Old Abe With Shield still bank, American, circa 1880, in gold paint, which took $1,440. Above high estimate at $960 was a brightly gold-painted Rabbit Lying Down still bank in near mint condition. And a lot of two matching banks from Kenton, a donkey and an elephant, each painted gray with a red saddle, would bring $840. The collection will continue to be offered throughout the year. The next opportunity comes with another 100 examples in the April 12 Bertoia Basics sale. Note: To read our review on the September, 2018, Bertoia sale including the first offerings of the Frank Mohr and Douglas Jackman collections, visit www.antiquesandthearts.com/bertoia-auctions-sells-three-collections-trains-toys-still-banks. Unlike many 33-year-olds, Michael Bertoia is not an emerging collector. Indeed, the auctioneer is far from it, but it is still a rare sight to see a single-owner collection of quality and depth from someone his age come up for sale at auction. 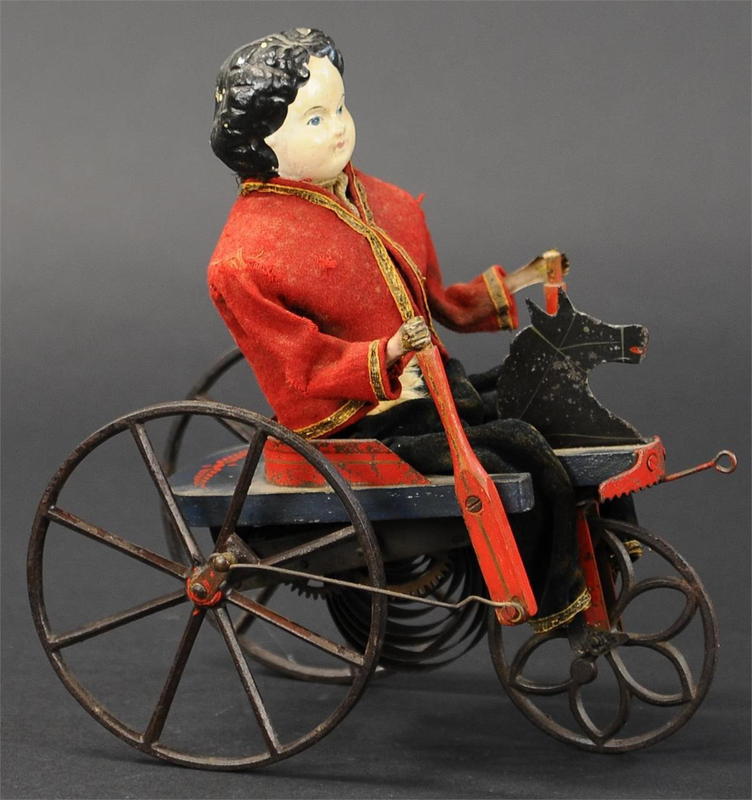 Bertoia’s penny toy collection, offered in 94 lots on March 9, traced its genesis back to his own beginnings in the trade as he followed his father, Bill Bertoia, around to auctions and shows throughout the country. Bill Bertoia would place the pristine penny toys in the booths of his dealer friends, some he would have paid much more than $25 for, so that Michael could learn how to buy. “I only found out when I was 27,” he laughed. But that education would serve him well going forward. By 2019, Bertoia had amassed some 175 penny toys, his favorites being those with movement or whimsical fantasy subjects. With more than two decades of collecting them, there are some – like the Walking Rabbit by Meier – that he has never seen another example of. Michael Bertoia stands with his collection of penny toys. Bertoia began collecting them with his father, Bill Bertoia, when he was ten years old, and two decades later was willing to part with them in pursuit of other areas of collecting interest. He kept half of the remaining collection to pass down to his son, Aldo William Bertoia. And it was that fine eye and decades of gathering pristine examples that bidders found enticing. 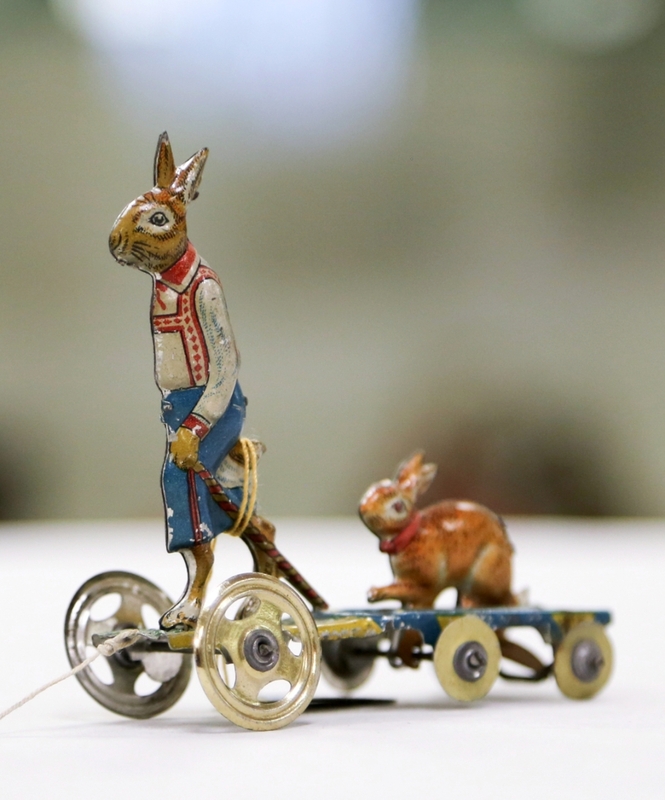 At the top of the collection was the Walking Rabbit by Meier, which featured a father rabbit holding a rope and pulling his bunny child behind in a wagon, that sold for $6,000. An Amusement Ferris Wheel Ride in pristine condition took $5,700. 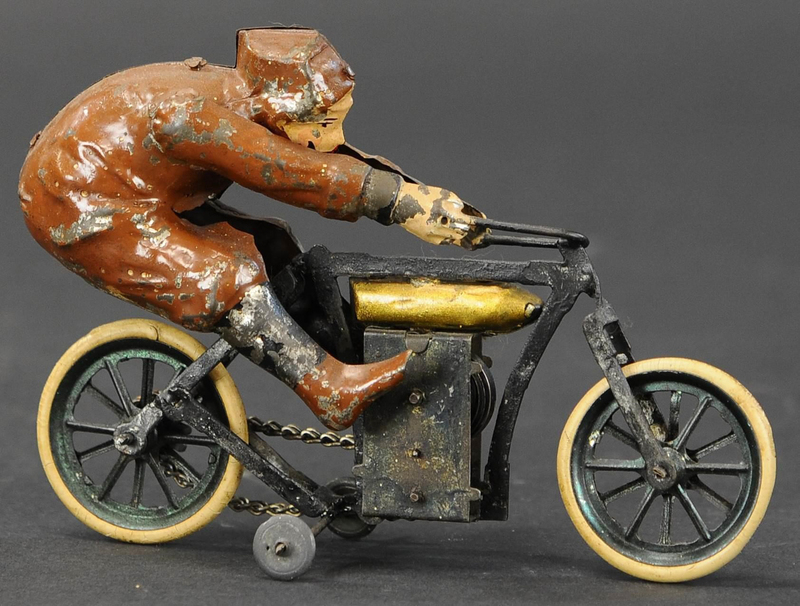 A Tri-Cycle Rickshaw penny toy by Fischer would sell for $5,400. With its whimsy and storybook reference, Mary and Her Lamb would do better than its expectations, selling for $4,800. The lamb’s head bobs back and forth as the wheels turn. “It’s a popular piece and has a great look and great action. I expected it to do well, but that would double my expectations,” Bertoia said. Produced with a solo driver and a passenger variant, Kellerman’s Motorcycle With Sidecar would hit $3,300. 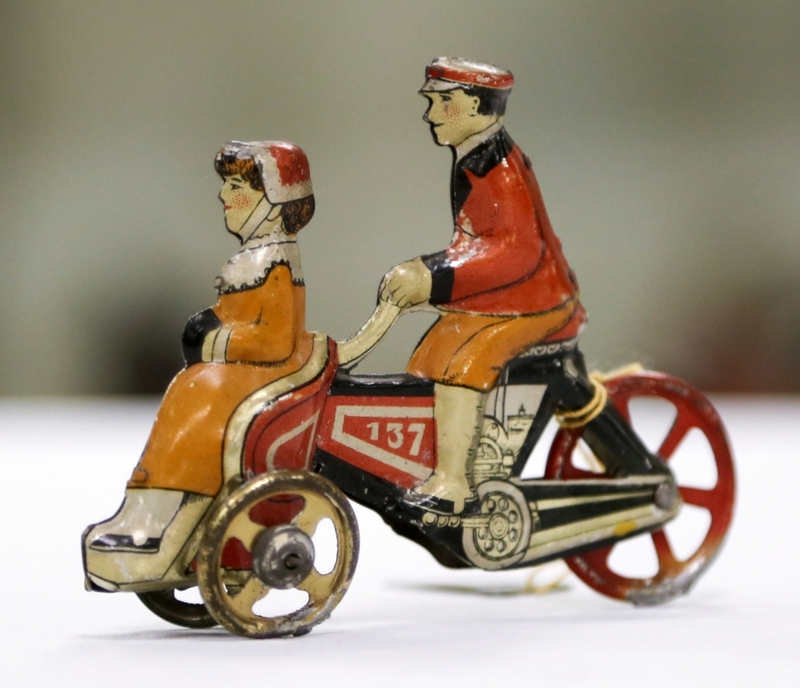 At the same price, though from an unknown maker, was another Motorcycle With Sidecar featuring a civilian driver and a little girl in the passenger car. Behind at $2,700 was a colorful World Merchant Flagship in pristine condition. 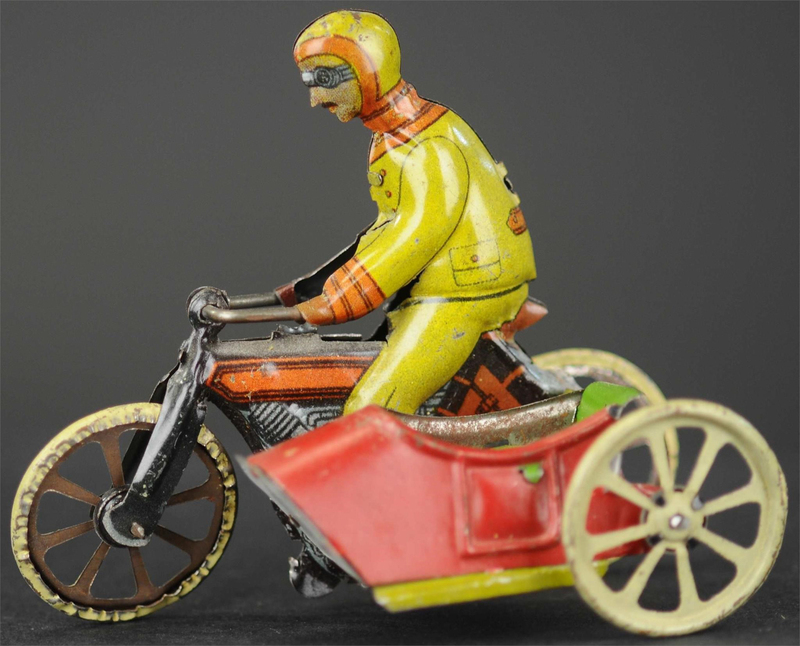 At the same price was a Soldier On Horse and a Civilian Motorcycle penny toy from Meier. All but one of the penny toys listed above fell into that category of doubling and tripling their estimates. Michael Bertoia was pleased with the results, though after spending the better part of two decades looking at them, he lamented letting some of them go. Bertoia plans to pass his remaining collection of penny toys down to his son, Aldo William Bertoia. The premier offering from the collection of Sam Downey Jr, clocking in at just above 400 lots, was sold the entire second day of the sale. Downey Jr began collecting with his father, Sam Downey Sr, who many will remember as a dealer from the 80s. Downey Jr was an active member in the ATCA and could always be counted among attendees at regional toy shows. “Sam pursued rarity and beauty with a focus on a specific time frame and style,” Bertoia said. 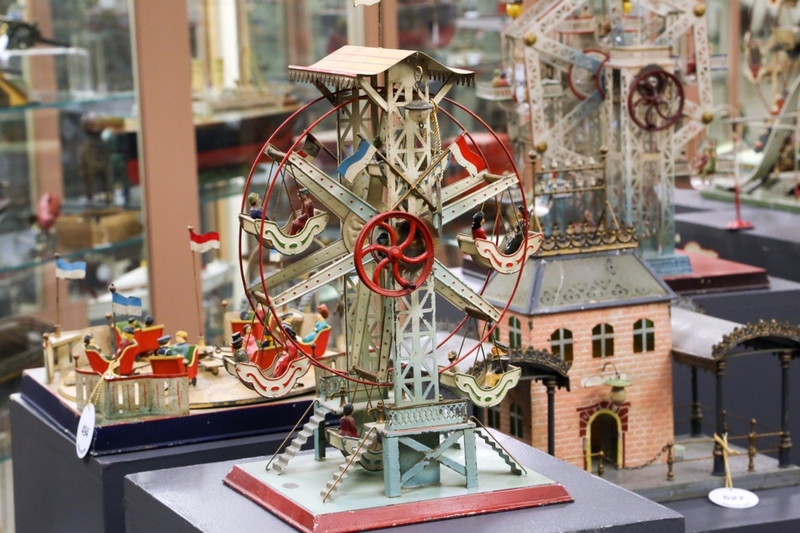 Downey’s collection of Marklin, Carette and Ernst Plank would survey some of the greatest examples from these makers in the context of a vast expanse of transportation toys. 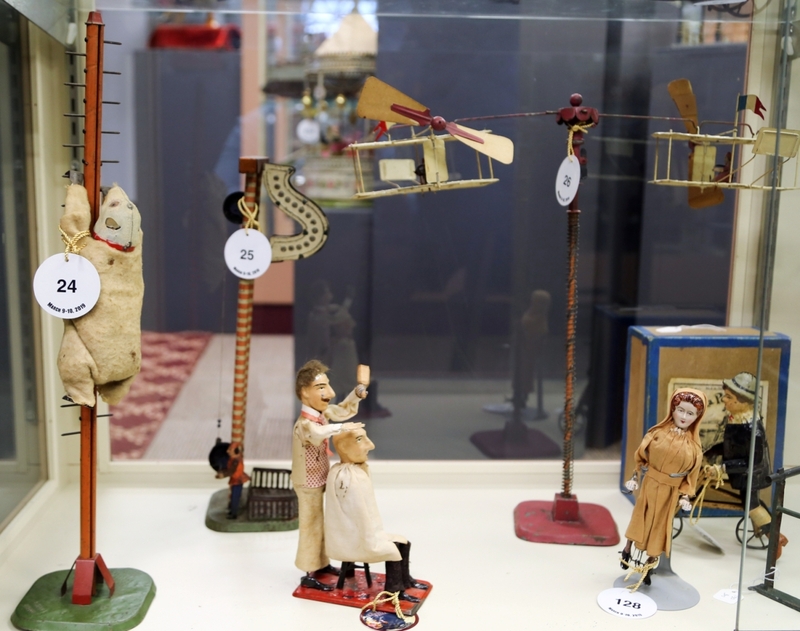 From Downey Jr, bidders were offered an old-time collection of boats, submarines, zeppelins, trains and their accessories, airplanes, motorcycles, live-steam and hot air engines and early tin steam toys. Two Marklin ship examples lead the collection. At $57,000 was the cruiser Bremen, a live-steam representation of the Imperial German Navy’s cruiser of the same name. It was 25 inches long and built in the 1900s. 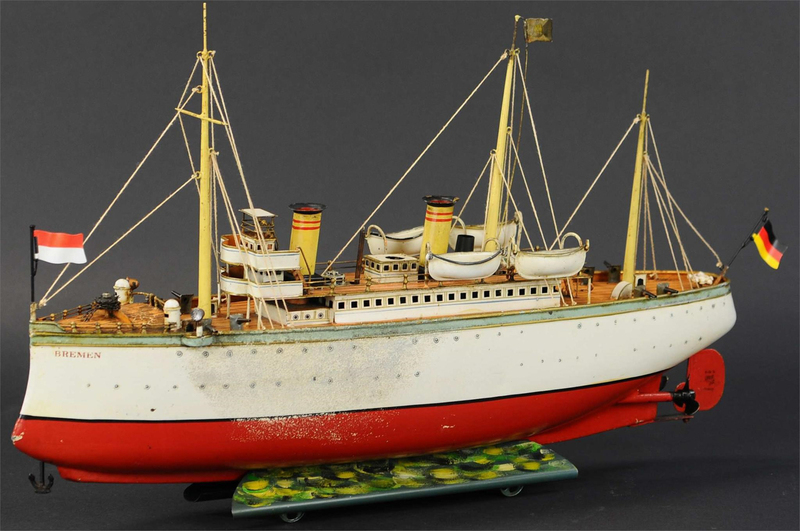 Behind at $54,000 was Marklin’s largest boat, the ocean liner Augusta Victoria, which measured 45 inches long, weighed about as many pounds, and was ex-Malcolm Forbes collection. Other boats performed well, including a large-size Marklin torpedo boat, which brought $42,000 above a $25,000 high estimate. Between estimates were the 28-inch-long Marklin battleship Baltimore, $33,000, and the Marklin Rheingold paddle wheel riverboat, $20,400. The top lot of the sale was a Marklin cruiser Bremen that brought $57,000. Circa 1915, it was a live steam representation modeled after the Imperial German Navy’s cruiser of the same name. Samuel Downey Jr collection. A number of Gunthermann toys would produce surprises throughout the day. 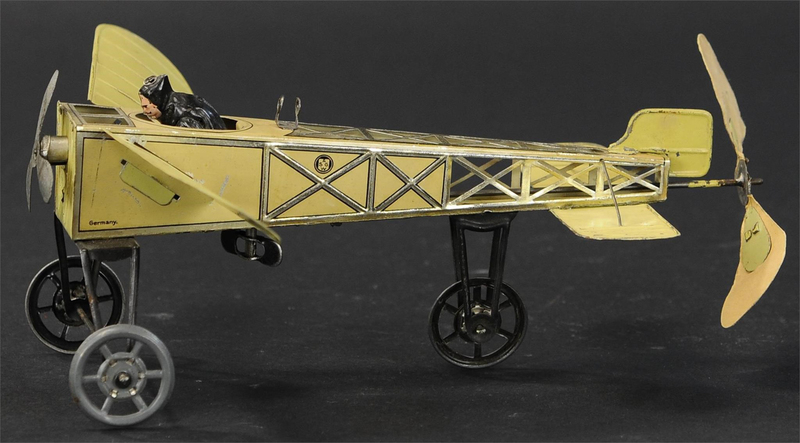 The largest surprise of Downey Jr’s collection was a medium-sized Gunthermann Bleriot wind-up pusher-style airplane, which sold for $42,000 on an $1,800 high estimate. According to Bertoia, the result was just an old-fashioned bidding war between seasoned and determined collectors looking to upgrade. 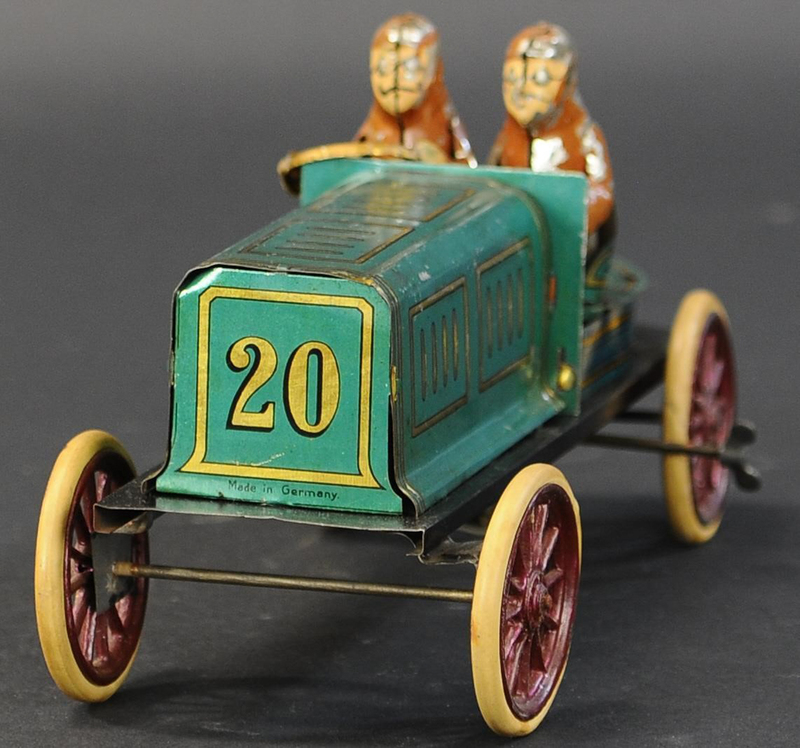 A Gunthermann racer with two figures driving an early green number 20 race car would best its $12,000 high estimate to sell at $29,000. Not far behind was a Gunthermann racing motorcycle where the rider is seen barely being able to hold onto the fast bike. It sold for $24,000 on a $7,500 high estimate. Just in time for St Patrick’s Day was a Gunthermann Gordon Bennett race car in the largest size with two drivers and a four-leaf clover on the hood. It brought $16,800. Trains and their accessories, Downey Jr’s largest focus, attracted broad attention that saw international buyers flying in for the sale. Chief in the category was a Carette Vauclain O gauge clockwork driven 4-4-0 American outline locomotive that brought $18,000. 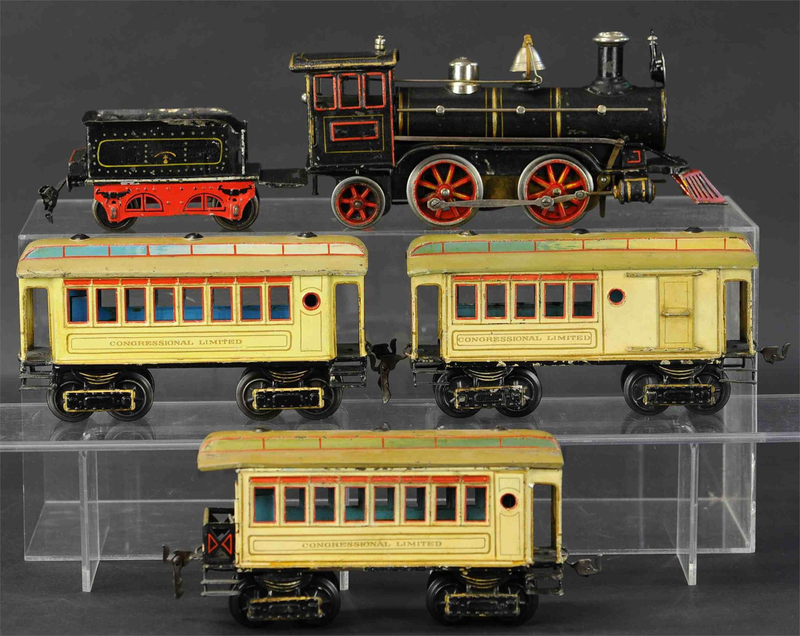 A Marklin Congressional Limited set, 1 gauge, doubled the high estimate and took $16,800. Right behind at $16,000 was a Marklin O gauge American Eagle set, while a 2 gauge set of two American Eagle cars would do $9,000. Made for the US market, Marklin’s 4-4-0 locomotive with tender would double its high estimate to produce $12,000. While train collectors can get into specific niches, Bertoia noticed that Downey Jr’s collection of varied makers, gauges and styles was contagious. Steam engines were an interest of Downey Jr’s, and while he didn’t have many, he did have a number of rare examples also including hot-air engines. Vertical steam engines caught the highest bids, with both an Ernst Plank Cosmos vertical steam engine, 15 inches high, and a Marklin vertical steam engine, 16 inches high, each earning $2,700. Behind was a Schoenner vertical steam engine, 15 inches high, that brought $2,160. The best hot-air engine was by Krauss and featured a cast iron design on a lithographed brick base. It brought $1,680. Among lithographed steam accessories, Downey Jr had many. 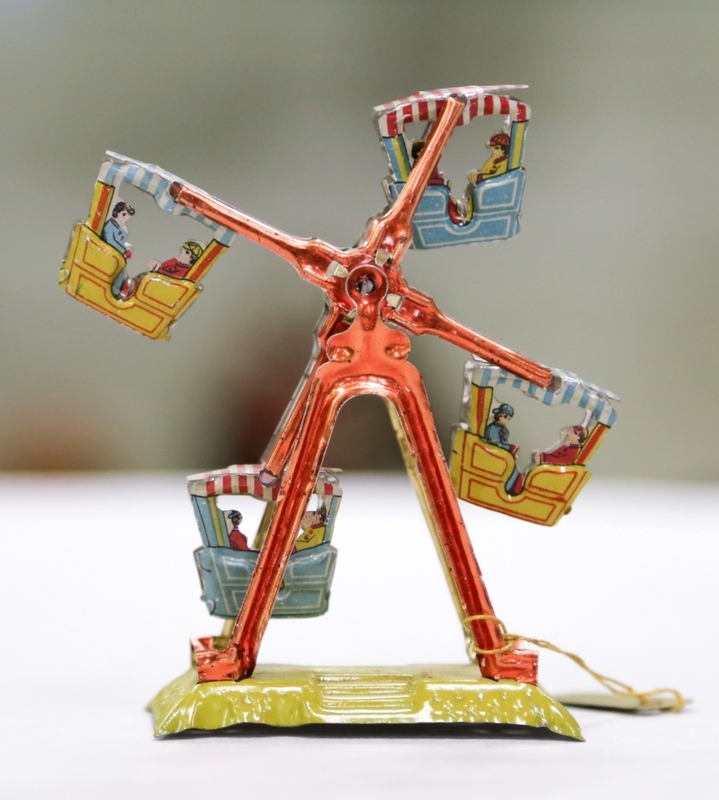 Leaders in the category were two Ferris wheels, one by Doll et Cie, 19 inches high in pristine original condition, $16,800, and the other by an unknown maker, 29 inches high, in nearly all original condition, $13,200. The rest of the Sam Downey Jr collection will be offered in Bertoia’s November sale and includes some of his other collecting interests, such as shaving mugs and militaria. All prices, as reported by the auction house, include buyer’s premium. 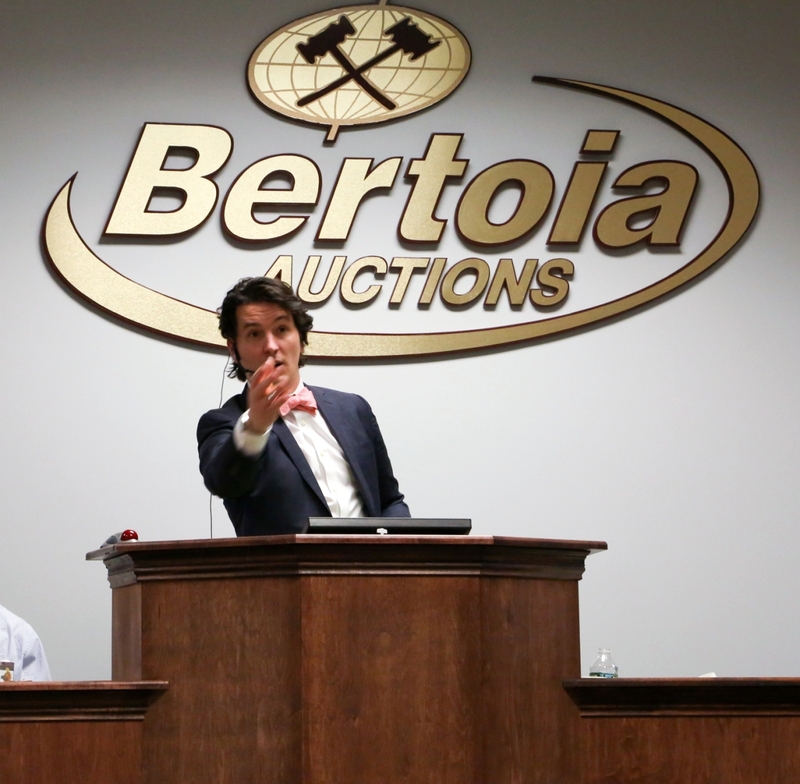 For more information, www.bertoiaauctions.com or 856-692-1881. Michael Bertoia had an idea of which penny toys would fly above estimate, and before the sale, he related to us that this was one of them. 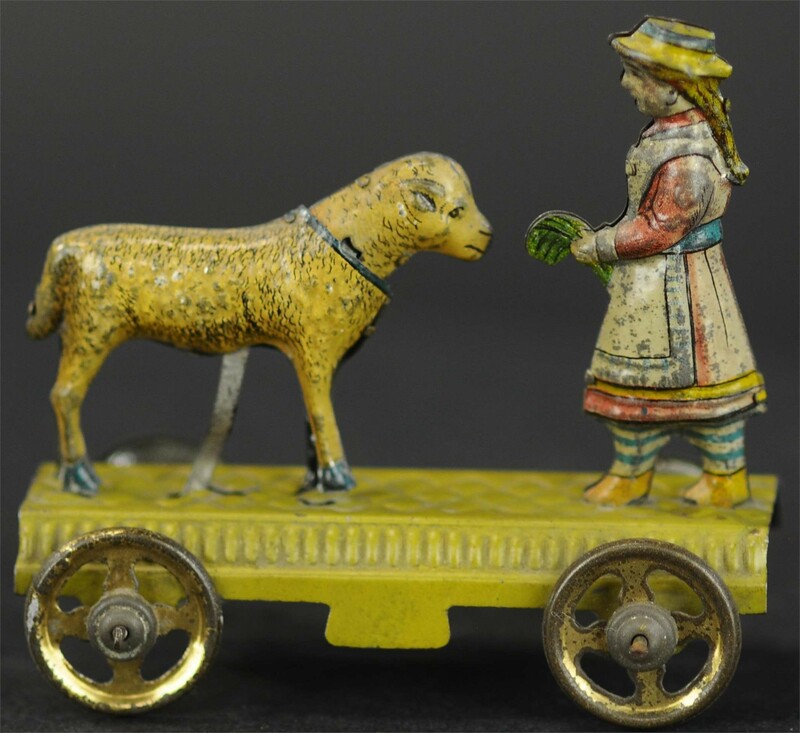 The Mary and Her Lamb penny toy sold for $4,800 above a $1,500 high estimate. Michael Bertoia collection.